Went shopping today for more dorm stuff, and we spent a lot of time at Bed Bath and Beyond, kind of checking out the bedding and stuff. Since we waited until so late to go though, they were pretty much cleaned out. Actually, every BBaB everywhere is supposedly cleaned out, as far as certain items are concerned. Wow? We got a pillow and a sheet set. Fun stuff. Okay, and this is the most important part now.... After Costco, we went to Jamba Juice. And there was a really cute guy working there. :D He looked kind of like the way Hatticus used to look, except he had glasses and seriously, he was pretty cute. Heh. The lady before me got her smoothie not long after I ordered mine, so I was kind of waiting by myself for a bit. (My mom went to Starbucks) I was just standing there and the guy says "hey, look at this," then holds the blender upside down. It was like in those commercials for the mega-blenders where the stuff is so thick it just sticks in the blender. I laughed, partially because it was so jammed in there, and partially 'cause he had this goofy look on his face and DID I MENTION HE WAS CUTE? Yes, so, that is my news for today. My mom woke me up at seven fifty this morning. She said I had to go the the Academy of Science because my brother pulled an all nighter and was too tired. I grumbled (a lot), but showered and dressed. The instant-- the INSTANT-- I finished, she knocked on my door and said I didn't have to go after all. Well, screw that, I said. I had gotten ready, I was going. So I went. And took some pictures. Have not uploaded them yet. Did I mention I went to sleep around three, four last night? Yeah. Angie: why was i recording your drunk ramblings? I just realized I put on the same outfit as the last time I hung out with my friends. Ah well, I doubt anyone will care. And anyway, most of my clothes are packed up, so it's an understandable mistake.... right? No pictures until I can get to Varsha's place... we used my memory card in her camera, so I don't want to connect it to the computer in case it can't transfer the video she shot and it erases it. I only had room for one picture anyway, and it's just the sticker I got from donating blood. It looks like it'll be a good day. Alright, so it did, as I thought, turn out to be a good day. And I finally told Alice, and nothing changed. Curious about the title? I'll elaborate in a sec. 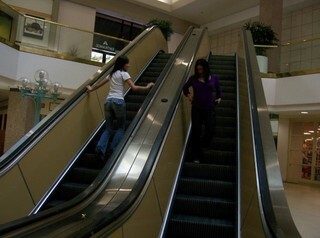 First, this picture of Angie and Phoebe riding the escalators the wrong way at the mall. This is the biggest suitcase I've ever owned. As you can see, it's apparently not big enough. You've seen Monty Python's The Holy Grail right? If you haven't, SHAME ON YOU, YOU MUST HATE COMEDY. And they're cozy, just to let you know. Oh so cozy. -I'm up at one in the morning and I'm donating blood tomorrow at 11:45. I should be sleeping! Also, I am worried that I'm a square. The squariest kind of square. :0 Four equal sides, and four right angles, type of square. A NUMBER MULTIPLIED BY ITSELF KIND OF SQUARE. Well, now I'm just worried that I'll be alone in my academic humor at St. John's. And finally, the Dude Whose Name I Do Not Believe I Have Ever Mentioned Here and I were discussing hangouts in New York which will most likely never happen due to the incredible coincidences that would have to take place in order for them to exist. My Youtube viewing history makes me laugh. At around eleven, my mom knocked on my door and handed me a phone. I picked up said phone, assuming it was one of my friends or even someone from St. John's. 'Twas someone from the Stanford blood drive. They were like "we're having a drive at such and such mall [crap I'd better look that up] from eleven to four on Saturday. Would you be interested in donating?" I would never turn down a blood donation appointment unless I had a legitimate reason, so of course I said yes. And she asked me what time I would like to schedule my appointment. For some reason my brain just dies on me when something is related to numbers or time, so I said "uhhhhh... how about ten." And she replies "erm, it's from eleven to four." Sudden realization that ten in not included in this "eleven to four" bracket. "Oh... sorry, I just woke up." "I can schedule you for eleven forty five. Does that work?" I later realized that I probably sounded like some sort of English speaking toad over the phone, since my throat was kind of dry and I was half yawning through most of my words.